It is really easy to get so carried away by what is happening in education in the UK today, the opportunities versus the challenges, the promoters versus the blockers, the aspiration versus those in a time warp....and then adding the current financial situation....!! Given that, it is just really fab when I hear about ambition, innovation and vision really being implemented. I am really pleased to see that the Steve Sinnot Foundation has really made massive progress since it's launch last year. 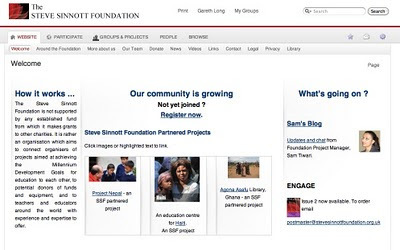 The Foundation is named after the late Steve Sinottt, General Secretary of the National Union of Teachers in England and Wales until his tragic death, in April 2008. I heard about it before it's launch whilst involved in a totally unrelated project with one of the founding directors. World leaders at the United Nations have set the Millenium Goals to tackle issues of poverty and deprivation. the goals for education includes a commitment that, by 2015, every child will be able to complete a full course of primary education. It goes under the slogan "Education for All". 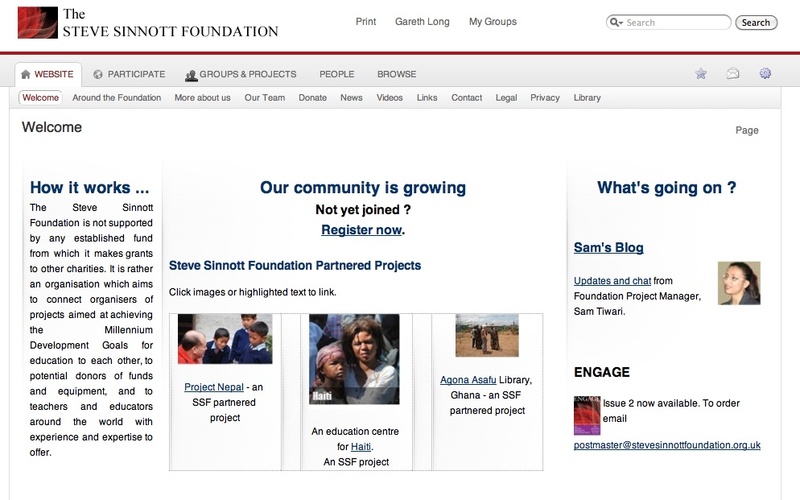 The Steve SInnott Foundation is a UK based registered charity with a worldwide aim to promote Education for All, but they do not believe that education is ever a matter for charity - frankly, I agree with them. It IS an entitlement for those who receive it and a crucial investment for those who resource it. With economies in the developed world having their own difficulties investment must be made in the education of the world's children to secure new growth! Already linked to projects in Ghana, Haiti, India and Nepal amongst others, the Foundation's massive ambition is really humbling but very exciting. Interestingly, it sees it's role to connect organisers of projects aimed at achieving the Millennium Development Goals for education to each other, to potential donors of funds and equipment and to teachers and educators around the world with experience and expertise to offer. It is not supported by any established funds. For those readers who have not come across the Steve Sinnott Foundation before - please do have a look, and if you can help in any way, please do contact them. It is just an amazing project and one that deserves as much support as possible. It is always great to talk to students who are animated and engaged with their work. This is especially true, and rather special, when that student has previously had many negative experiences in schools. 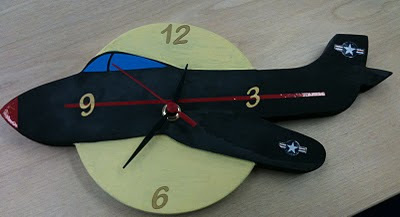 The clock above is the product of a young student in a school for students with severe emotional and behaviour problems. It' s good, really good - with great care and attention to detail. This project has taken him time and he admitted it he was proud of it. The approach was not just a design technology project but one using a variety of skills and cross curricular approaches. The student involved happened to come into a room during a break in a new school design session and spontaneously started to talk in detail about his clock to a group of architects and engineers. They all showed real interest and engaged him in detailed discussions about the preparation and creation techniques. He got loads out of this project and his time talking to adults about his own learning "i's personal in't it"... He noted that he had never had the chance in his previous schools..... - that's a pity really - it does make a difference and students always remember it! Getting better - lets just say it! I just liked this fab photograph by my friend Trung Le of oWp/p : Cannon Design... Le and oWp/p : Cannon Design are the brains behind the excellent 'The Third Teacher' book, something which I was also involved with in a small way. 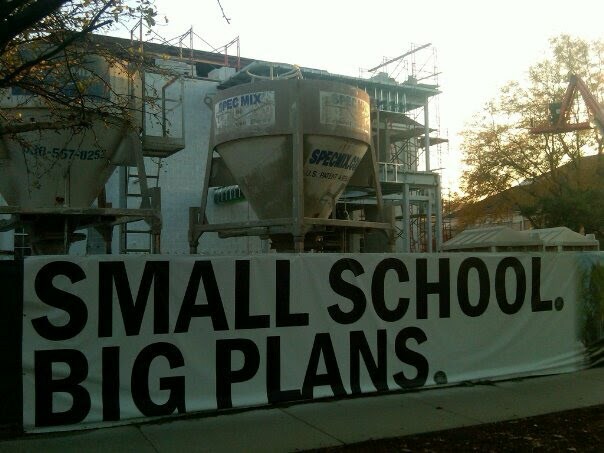 If a school is going to do something special - why not tell people about it? Far too many people try and hide lots of ideas away in case others don't like it or if it's too controversial - as teachers why would you do that? Getting better if surely what we are all about as is learning to take new challenges in a secure environment? I spent some time recently talking with students from a couple of schools in the UK, a mainstream secondary and also a secondary EBD school. The conversation on both occasions veered towards dining facilities. (Many will know that all conversations about school environments always revert to dining, toilets, lockers and stairwells at some stage). What is surprising to some staff is that students always seem to ask if they can have an external dining space, despite the UK weather. They DO know how they work and what they want. Any school placing seating outside knows that it is always used. I'm not really sure why this would be a surprise - many students love being outside. The secret is to make such areas similar to the professional environments as they see in every other aspect of their lives in shopping centres streets and so on. Why shouldn't they be of high quality? One teacher in a school surrounded by featureless asphalt recently noted that:"its only for the kids - why bother?". Oh dear.... and they wonder why the school has problems issues at breaktimes!! 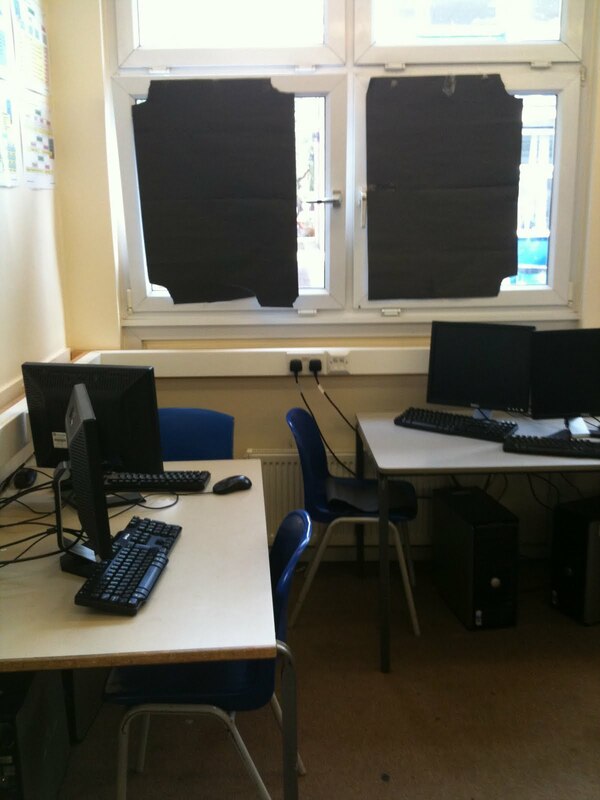 I occasionally post what I term 'nightmares' on this blog.... visiting a school recently I was again dismayed to see some of the environments we expect students and staff to work in. 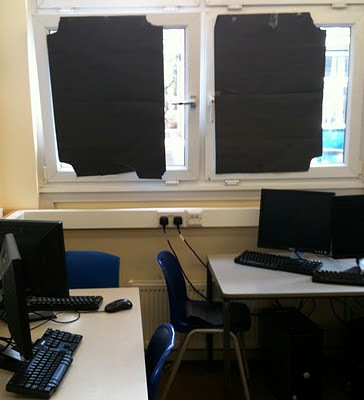 For an ICT room - the layout, furniture and shade strategy is all wrong... the days of sticking torn sugar paper onto windows with bits of sticky tape should surely be over in the Third Millenium? How can this encourage students to achieve high standards, positive attitudes and a business like professional approach to learning ? It was quite fascinating that, for one of the first times I have heard a significant number of people in America really talking about transformation, personalisation, independent learning, project work, integrated ICT and many of the phrases we have used in the UK for years. Previously it was my experience that it was just a few. Some of these phrases are now considered not acceptable in the new regime in the UK - but actually the names are irrelevant - it is the actual learning and teaching strategies that are increasingly being incorporated in schools that is important. We cannot return to the past nor would we want to. Educators have learnt a huge amount over the past few years about broadening approaches to learning, students are much more aware and engaged in how they like to learn. One of the fascinating parts of my job is working with some truly outstanding professionals, both in education and design, to create the best learning environments to support the process. No matter what the rhetoric that can be heard, there is now no doubt that school environments really do matter and do positively students impact . 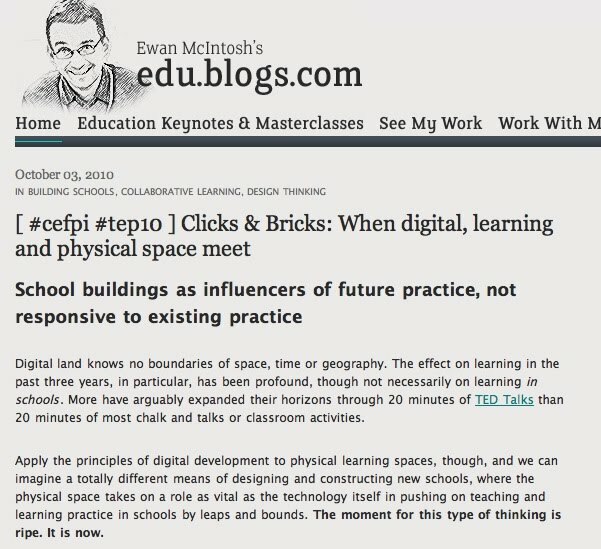 I was interested to read Ewan McIntosh's blog on schools buildings as 'Influencers of future practice, not responsive to existing practice' - he raise many excellent points in it. I am also obviously very pleased that he has linked to this blog during the course of it. 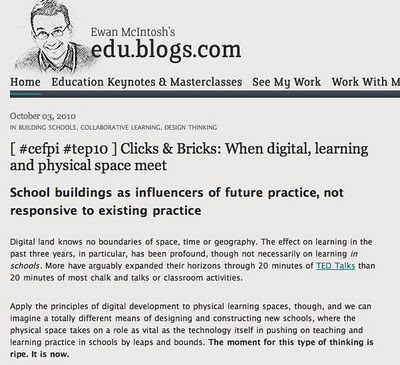 Ewan is one of Europe’s foremost experts in digital media for public services, particularly in education and has been a significant influence on teachers in the UK and abroad. He and I have 'talked' over a couple of years, by phone, by email and through blog comments. Whilst I have 'met him at conferences, I enjoyed the opportunity to spend a couple of days talking to him at the cefpi World Conference in San Jose last week. Inspirational and fascinating.It's bizarre that we have to go all the way to the West Coast to do so though. Thanks for the mention though Ewan. I'm lucky to work with some really great people, who are contributing to the education process through experience, thought and experience. No wonder things ARE getting better despite what some people are saying! This year at cefpi in San Jose, both the dinner with fab food and conversation continued, with largely the same twenty or so people. It is fair to say that the conversation was much more advanced and detailed this year, even if fewer people spoke. it is clear that there is a growing commitment to the use of technology to support learning in the US. The focus seems to be growing there, as it becomes a less centrally discussed subject here - which frankly, is bizarre. It was really pleasing that we were joined by interesting and well known people such as Ewan McIntosh, at cefpi for the first time. Ewen bought another fascinating dimension to the discussions and his own brand of humour, knowledge and intellect. He certainly enhanced the conversation. I noted this year that the 'genie is out of the bottle' - we cannot put 'the stopper back into it'. Those schools who under BSF have gained generous, robust and reliable systems, along with plenty of kit have a transformed ICT experience from the days of unreliable, slow systems that frustrated staff, students and community alike. This will encourage greater confidence for everyone and ICT will become an increasingly important part of learning. BUT, what about those schools who have lost out in the BSF programme - they will now potentially not get the enhanced ICT provision in the same way as the earlier phase schools. This just cannot be fair, and potentially brings in greater inequalities in provision between BSF schools and those whose schemes were stopped. I know that there will be a range of strategies, and schools are responding in a variety of ways, but there is little detail yet. What ever political decisions are made, equality for all learners is just vital - we cannot have different levels of provision for people depending on where they live. So how is it going to be sorted out?